The Lymm May Queen and Rosebud chosen for this year were Katy Robinson aged 11 years and Kate Hulme aged 8 years. They took over the roles from last years May Queen Amy Glover and Rosebud Charisma Mitra. This years May Queen Festival photographs were kindly covered for Lymm Net by two of the senior members of the discussion forums, Granville and Steve. A big thank you goes to them, for this was great coverage, we think you all will agree! The day started with rather dull weather, but turned into a beautiful day. 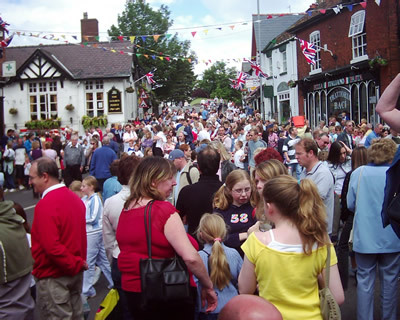 It was a great success and plenty of people came to Lymm to join in the celebrations. The village looked very festive decked out in all the flags and bunting. Thanks go to all the organisers, the Police and volunteers who made the day another wonderful event to make people proud to be part of the village. Check out the rest of the photos to re- gain the atmosphere of the day! Click here.